“Following an extensive competitive selection process, Waterfront Toronto has chosen Hines, one of the world’s premier real estate firms, to develop Toronto’s next great waterfront neighbourhood. Hines will help Waterfront Toronto transform the Bayside development site into a vibrant and diverse mixed-use neighbourhood, complete with 1,700 homes, a bustling retail, restaurant and entertainment corridor, and office and employment space for 2,400 jobs. A rendering of Bayside Toronto. Image by Hines. 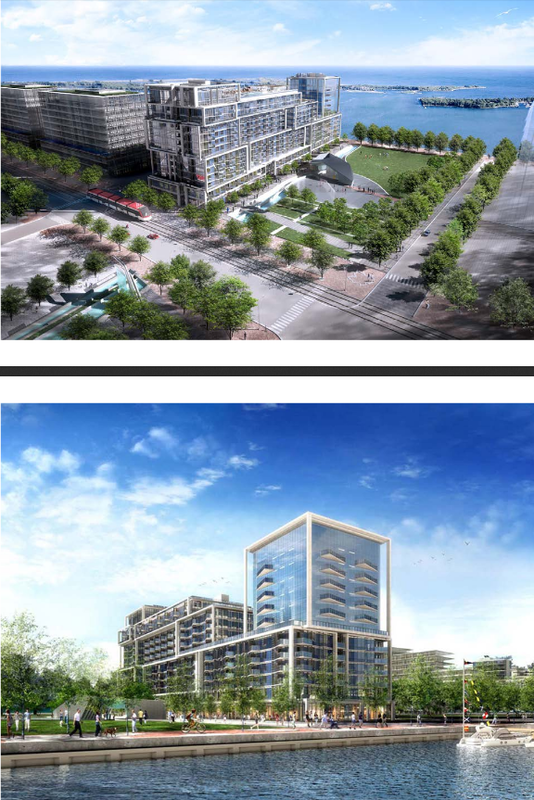 A plan to develop 80 affordable rental homes within a mixed-use market condominium building on the Toronto waterfront was adopted by City Council on June 10th. 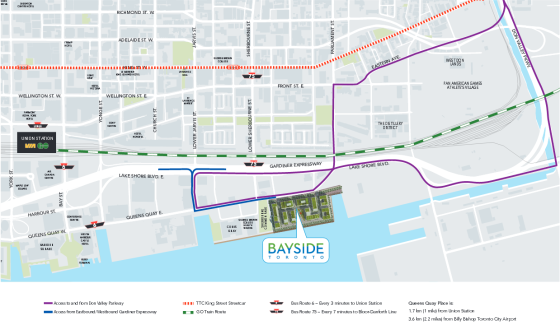 $26-million Bayside initiative is to be built and operated through a partnership among the City, Waterfront Toronto, developers Hines/Tridel and Artscape. Situated in the heart of the emerging East Bayfront waterfront district and only five minutes from Union Station, Bayside Toronto is located on a 13-acre site along the water’s edge between Lower Sherbourne Street in the west and Parliament Street in the east. Construction is expected to be completed by 2018-2019. This vibrant, mixed-use waterfront community is part of a 2000-acre waterfront revitalization—the largest such initiative in the world. Hines was selected as the Master Developer for this project through an international competition that drew 17 proponents. Hines is a privately owned, international real estate firm. The Hines portfolio of projects underway, completed, acquired and managed for third parties consists of more than 1,317 properties including skyscrapers, corporate headquarters, mixed-use centers, industrial parks, medical facilities, and master-planned resort and residential communities. Currently, the firm controls assets valued at approximately $28.2 billion. “Bayside Toronto will contain more than two million square feet of residential, office, retail and cultural uses. The office buildings, called Queens Quay Place I and II, will be designed by world-renowned architects Pelli Clark Pelli, while the first residential phase, named Aqualina at Bayside Toronto, will be designed by New York’s Arquitectonica. Bayside will be a year-round urban destination that will combine functionality and architectural distinctiveness with some of Toronto’s best public spaces. The Bayside community is a vital part of Canada’s first LEED® Gold certified neighborhood (Stage 1 Certification achieved under the LEED ND program). Additionally, each building in Bayside is expected to achieve a minimum of LEED Gold certification. Bayside Toronto will offer residents and other users Internet speeds up to 100 times faster than generally available to other users. Above, two renderings of Aqualina at Bayside Toronto (a 13-acre mixed-use development) contains 363 condominium suites, ranging from one-bedroom to three-bedroom residences designed with families in mind. Suite sizes will range from 560 square feet (52m²) to just over 2,100 square feet (195m²). Sherbourne Common is the park adjacent to Aqualina at Bayside Toronto and Queens Quay East street. The 80 affordable rental homes are to be part of the Hines/Tridel Bayside development, located between Lower Sherbourne and Parliament Streets in the emerging East Bayfront neighbourhood. The one-, two- and three-bedroom apartments are to be built in a mixed-use building that would also contain 225 market condominiums and retail space. All the affordable units will be accessible to visitors, with five per cent fully accessible. The affordable housing component would have its own entrance, elevators and parking. The building will be designed to Waterfront Toronto’s Design Excellence standards and built in accordance with the Affordable Housing Office Design Guidelines. The affordable units will be owned by the City and operated by Artscape. The Bayside development will assist in fulfilling the City’s Central Waterfront Secondary Plan requirement for affordable housing as well as Waterfront Toronto’s commitment that 20 per cent of residential units in new waterfront communities be affordable rental housing. 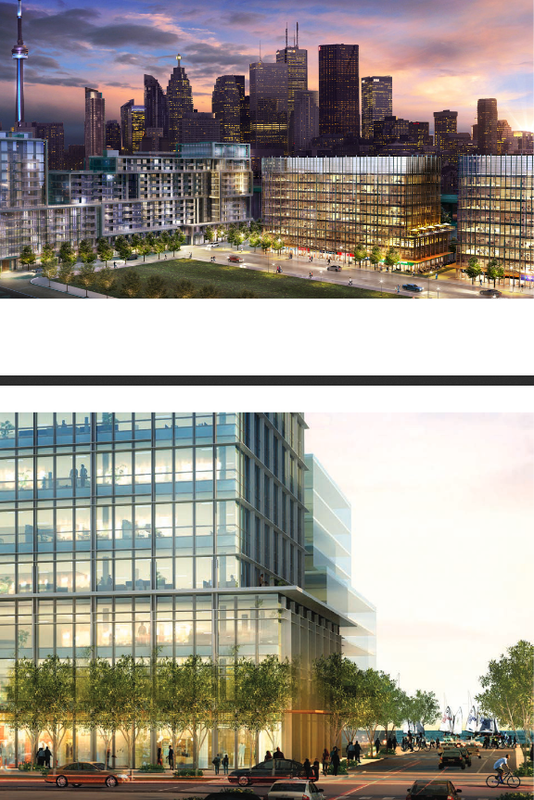 Above, renderings of Queens Quay Place I and II (depicted on the right-hand side in the top image), which are two nine-story office buildings containing 215,000 square feet each. The buildings share a landscaped plaza and contain retail at the ground level, underground parking and easy access to public transportation. The park adjacent to Queens Quay Place is Aitken Place Park. 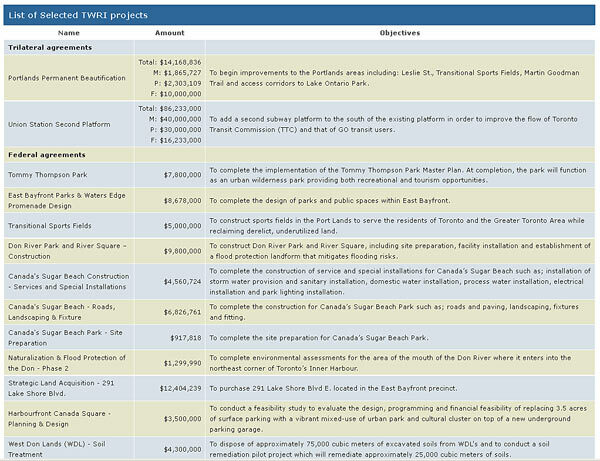 Here are some facts about the Bayside Toronto development project. “What makes a great waterfront? John Campbell, Waterfront Toronto’s President and CEO, offers his vision for the future of the city’s revitalized waterfront. The vision focuses on creating vibrant mixed-use neighbourhoods that integrate residential, commercial and light industrial uses. …Toronto’s waterfront has been abuzz with construction and we are starting to see the dramatic results. New parks and public spaces like Sherbourne Common and Underpass Park have opened to the public. George Brown College has opened their new waterfront campus devoted to innovative training in the health sciences. The complete redesign and revitalization of Queens Quay is now under construction. Waterfront Toronto’s Intelligent Community initiative is another project that will soon begin to pay off. The infrastructure to provide ultra-high-speed broadband to every residence and office in the waterfront neighbourhood is being installed. Waterfront Toronto is the public advocate and steward of waterfront revitalization. Created by the Governments of Canada and Ontario and the City of Toronto, it is mandated to oversee, lead and implement the revitalization of Toronto’s waterfront. Explore the “new blue edge” at www.waterfrontoronto.ca . Today, Finance Canada releases the report Evaluation of the Toronto Waterfront Revitalization Initiative (TWRI). This Evaluation of the TWRI – conducted by Internal Audit and Evaluation, Department of Finance Canada, between April and September 2013 – fulfills the requirement of the Financial Administration Act, section 42.1, that all programs of grants and contributions be assessed every five years. As such, the evaluation examined the relevance and performance of TWRI over the fiscal years 2008–09 to 2012–13, covering a total of $269.2 million in contribution spending. On October 20, 2000, the Government of Canada, the Province of Ontario, and the City of Toronto each announced a commitment of $500 million to fund the TWRI. To this end, the Toronto Waterfront Revitalization Corporation (TWRC), a not-for-profit corporation, was established on November 1, 2001 to lead the waterfront renewal. In addition, the Government of Canada created a federal TWRI Secretariat to oversee the federal contribution and the TWRC on its behalf. “The revitalization of the waterfront involves over 2,000 acres of land, and takes form in traditional city-building infrastructure such as local transportation and sewers, and in contemporary urban development such as the regeneration of ecosystems and post-industrial regions, in order to deliver economic and social benefits for the region. The investment in the TWRI underlines the importance of Toronto as one of the largest commercial centers in Canada and enhances its international image as a global city. Here are some results of the Evaluation of the TWRI (Date modified: 2014-03-04). This is an update to my previous blog You’re Invited: Public Consultation on Toronto Port Lands’ Development & Implementation Plan Dec. 12, 2011. The Governments of Canada and Ontario and the City of Toronto created Waterfront Toronto to oversee and lead the renewal of Toronto’s waterfront. After much ruminations and discussions, the proposed Part II Plan for the Central Waterfront now requires public consultations in order to proceed towards City Council consideration and approval. 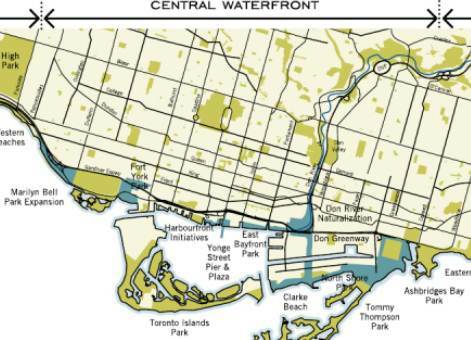 “Making Waves: Principles for Building Toronto’s Waterfront” is the proposed Part II Plan for the Central Waterfront, the City of Toronto framework for making Central Waterfront renewal happen. Central Waterfront Part II Plan, by Paula M. Dill (Commissioner Urban Development Services) and Paul J. Bedford (Chief Planner and Executive Director City Planning Division), 2001 City of Toronto, is organized around four core principles that will steer the renewal of the Central Waterfront. This will be a multi-decade effort.